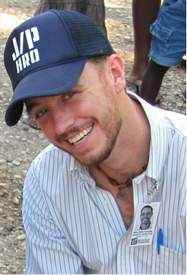 1999 Creighton Prep grad Benjamin Krause is Sean Penn's point man in Haiti for the actor's post-quake organization. A warning to parents of teenagers who want to serve the poor. They might wind up like 1999 Creighton Prep grad Benjamin Krause, who is actor Sean Penn’s point man in Haiti for Penn’s respected post-quake organization, J/P Haitian Relief Organization. Krause landed in Haiti after a dozen years of mostly international service work that began with a Prep-led trip to the Dominican Republic, where Creighton University operates a community-building and health care organization. Krause was an 18-year-old high school junior. He repeated the trip his senior year, found a college (Xavier in Cincinnati) with a strong service work component, spent summers in Latin America, served the U.S. poor and visited Haiti as a Jesuit novice. He left that to run an organization in Uganda, then pursued a master’s degree in international relations from Johns Hopkins University’s Washington, D.C., campus and then went to work for Catholic Relief Services in Africa. Krause was wrapping up his development work in Ethiopia when the earthquake hit Haiti. Two months later, in March 2010, the Catholic Relief Services sent Krause to Port-au-Prince on what was supposed to be a temporary assignment. Like the many Americans, including a number of Omahans who showed up to help after the earthquake, Krause was shocked by the scale of ruin and massive need. His principal work was in a growing tent camp, one of the capital’s largest, on a private golf course where Penn had been working with a growing staff. Krause and Penn worked closely together and then Penn hired the 31-year-old to be country director of J/P HRO. The camp population has dropped from a high point of 60,000 in April 2010 to 20,000 now. Penn hadn’t intended on starting an organization; it evolved after he had arrived with a cadre of medical volunteers who encountered so much need that the actor began to ramp up his efforts. J/P HRO has principally become the de facto manager for the Petionville Club Camp, coordinating the services provided there while also helping camp residents find their homes or make new ones. The organization helped move several thousand camp residents, on urging of U.S. and Haitian governments, to what was to have been a better location called Corail-Cesselesse outside Port-au-Prince. Government promises for that site never materialized, which attracted a lot of negative attention. Penn has defended his role, and Krause said J/P HRO is one of the most nimble, smaller organizations when it comes to rubble removal. Krause said the organization provides emergency medical services for 1,600 patients a week, schools for 400 children, community programming, small-business training, a recycling effort and rubble removal. J/P HRO has hauled out 10,000 dump trucks of rubble over the past 18 months, he said. He said Haiti’s need is huge but it helps to focus on specific, small goals and see forward motion.